Professor Gerard Reinmuth will chair a session at this year's Nordic Architecture Fair oin Gothenburg on November 8. Titled "The State vs The People", the session draws from Gerard's recent research into the agency of the architect in a post-political world. Hence the double title "the Architect vs The State" through which Gerard explores the potential of the state architect as a key actor who may aid the reorganisation of more equitable cities when compared to the relatively minimal impact that can be achieved from a single built object - the traditional focus of the profession. The primer for the session asks: "Who should the municipal architect be serving? Is it the politics of the moment – often shortsighted and populist – or should it be more lasting and democratic values? Gerard Reinmuth, outspoken principal of the Australian firm Terroir, invites you to a debate on architecture and politics." 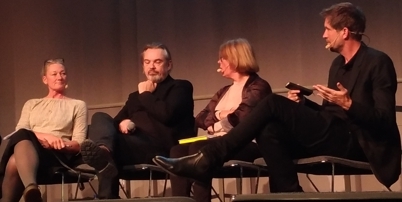 Participants in the debate include Torleif Falk (city architect, Stockholm), Páll Hjaltasson (architect and former chairman of the Reykjavik Environment and Planning Board) and Tina Saaby (city architect, Copenhagen).